Our development efforts are mostly trained on the new Roadmap platform—the next update is just on the horizon—however, there were a few DMPTool things that deserved attention this month. Assign Roles: The functionality that allows institutional admins to grant admin privileges to others was not terribly user friendly and it had a bug that prevented searching by email address. So we fixed/enhanced it with the following tweaks. You can also consult the revised help documentation on the GitHub wiki for instructions, although we hope it’s intuitive enough not to require a manual now. We moved the search box to the top, where admins can now search by first and/or last name. Then you click the notepad icon next to the appropriate user’s name to “Edit User Role” and check/uncheck boxes to grant/remove roles; then save the changes and voilà! Admins should now see a list of ALL users affiliated with their institution. Usage Stats: We implemented a *very* primitive metrics dashboard (screenshot below). 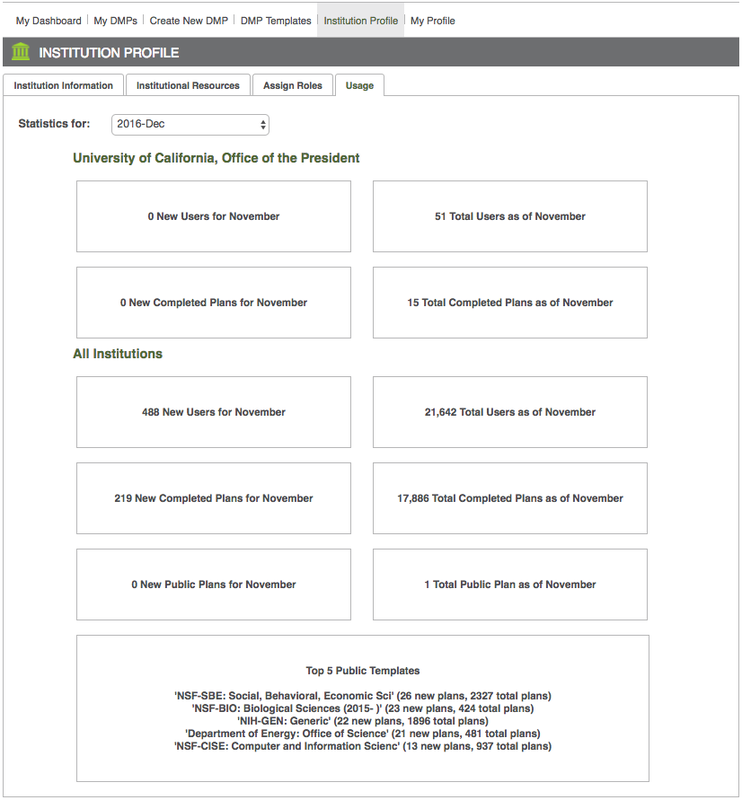 Institutional admins will see a new tab called “Usage” under the Institution Profile menu. Use the date selector at the top to view basic monthly and cumulative usage stats for your institution and for global DMPTool usage. The idea is to present this as a starting point and collect your feedback to design a bigger, better, and much more beautiful metrics dashboard in the new platform. We already plan to provide visualizations (e.g., graphs of change over time) and export to CSV in the future. Please note that you can still retrieve usage data in JSON via the API (instructions here). For now we’re keen to know what numbers and features are most useful to you so please don’t hesitate to contact us by email or create a GitHub issue. When users choose to create a new plan by copying an existing plan, they will no longer be able to start with plans that use “OBSOLETE” (outdated and inactive) templates. The plans created with these templates are still in the system, accessible to their owners, and visible in the Public DMPs list if set to public visibility; you just can’t use them as a starting point for creating a new plan. Obsolete templates exist for NSF-BIO, IMLS, and USGS; in consultation with funders, we’ve updated these templates as they revise their DMP requirements. Users are presented with this message if they try to copy a plan created with an obsolete/inactive template. Last week NASA launched a new Research Portal, with consolidated information regarding data management plans and publications. There are no changes to the DMP requirements as the public access plan remains the same. The big news concerns the creation of PubSpace, an open access article repository that is part of the NIH-managed PubMed Central. Beginning with 2016 awards, all NASA-funded authors and co-authors will be required to deposit copies of their peer-reviewed scientific publications and associated data into PubSpace. In response to the announcement, we’ve updated a few guidance links for the NASA template and reached out to the NASA Open Innovation Team—part of the office of the CIO— which appears to be in charge of these new initiatives. After releasing the review workflow enhancements, we encountered a bug that prevented the system from sending out an email notification if an institution did not create a customized message. Only one user was affected and we have since fixed the issue. We also added a grayed-out default message to the box on the Institution Profile page. We apologize if any emails went awry and invite you to test again and let us know if things are working as expected. You can also check out the updated documentation on the GitHub wiki. We’re deploying another batch of bug fixes this Wednesday, 8 June 2016 at 4:00pm PST. The release will involve a mini maintenance window to update the database—30 min max downtime, 4:00–4:30pm PST. Most of the bugs involve patching security vulnerabilities and database clean-up so they won’t be apparent to users. We did fix one issue that prevented work from being saved when users clicked to other parts of a plan without first selecting “Save Response” or “Save and Next” for the final question in a given DMP. Over the coming weeks we’ll be focusing our efforts on the Roadmap project. Stay tuned for another progress report following our exchange visit to Glasgow/Edinburgh next week to commence co-development with our DCC partners! We fixed an issue that prevented admins from uploading files for institutional logos. We created a static FAQ page on GitHub to replace the unreliable askbot service. We added a date field to the API call to get a list of users. This call enables admins to track new users over time. We updated links on the Help pages and other outdated info throughout the platform (e.g., we have a new CDL Director: Günter Waibel!). We’ll continue on a 2-week release cycle until all of the bugs are wiped out. You can follow our progress in the GitHub issue tracker and keep a lookout for updates. We also invite direct bug reporting and enhancement requests via GitHub issues.